Matt and Tim - from left to right. We are real down-to-earth people with high work ethics, good family values, and base our foundation on honesty, respect, trust, integrity, loyalty, and empathy. 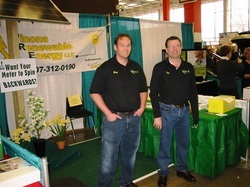 Why Winona Renewable Energy LLC? Our in-house experts are standing by to help you. Our Project Management team will guide you every step of the way. Our solar energy experts, in consultation with a structural engineer (if needed), will help determine the best mounting methods after carefully inspecting your site. We offer a 5-year workmanship warranty on our work that is one of the best in the solar industry. If you want to save money, lower or potentially eliminate your electric bills, increase the value of your property, make a smart investment, and help protect the environment for future generations, then please contact the experts at Winona Renewable Energy LLC and let us help you take the next step.